Life is short. Ride long on America's #1 scenic railroad. Hard at work up the pass.. Enjoy uninterrupted natural scenery along our 64-mile route. Waitin' for the Rio Grande in 1880.. The Cumbres & Toltec Scenic Railroad steams through beautiful fall color in September and October. 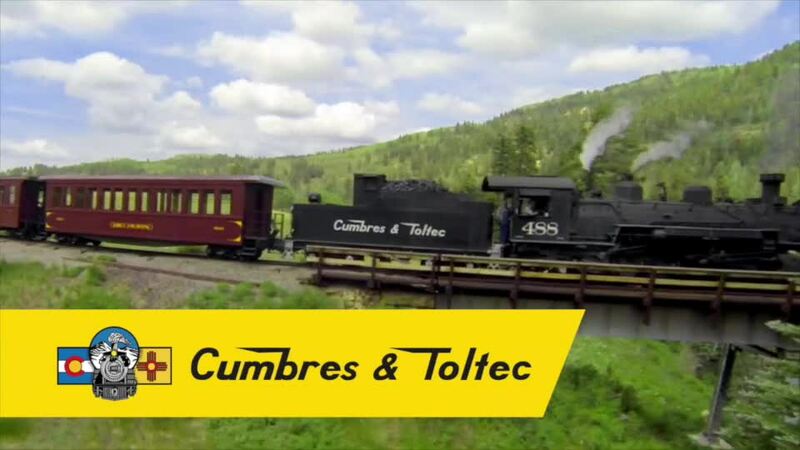 USA Today readers voted Cumbres & Toltec the Best Scenic Train Ride in America. Climb aboard this National Historic Landmark for a 64-mile day trip you'll never forget. Our coal-fired steam engine carries you through steep mountain canyons, high desert, and lush meadows as you zig zag across the Colorado and New Mexico border. Open your eyes to spectacular and rare Western scenery which can only be viewed from this train's unique route. Ride in the Victorian elegance of our deluxe parlor car or choose the budget-friendly coach car. Either way, a delicious buffet lunch is included. Trains depart daily from Chama, NM and Antonito, CO, from late May's blooming wildflowers through the golden leaves of October. A luxury motor coach chauffeurs you back to your starting point at the end of the ride. Life is short. Ride long. "THE RAILROADER" is a new short in National Geographic Short Film Showcase that follows the Cumbres & Toltec's very own John Bush, his story of falling in love with railroading, and why the C&TS means so much to America. Watch it here.